Management junior Kaitlyn Bloch opened two businesses before the age of 21 and plans to reshape the pet industry with her newest venture. 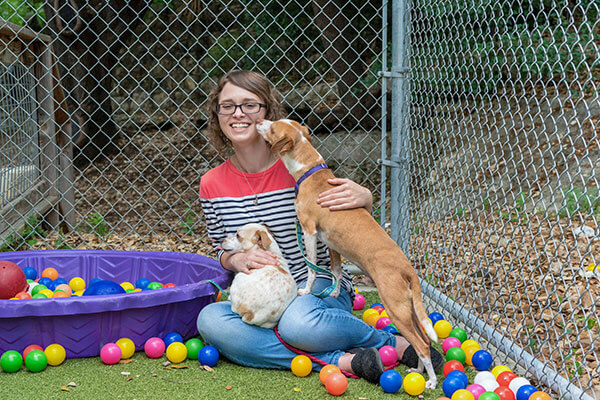 Kaitlyn Bloch gets some love from Alice (left) and Sinclair at the Paul Jolly Center for Pet Adoptions, a facility managed by the Defense League of Texas. If you want to help support this organization or find your own furry friend, check them out at adltexas.org. Most children like to play with toys; others like to dress up. But when Kaitlyn Bloch was a kid, she imagined being a business owner. Since age 11, the San Antonio native has known the exact industry in which she wanted to work, although unfortunate events pushed her in that direction. At the time, Bloch had pet guinea pigs, which her family bought from a local pet store. Bloch soon discovered that certain products from the store were harmful to her guinea pigs. One product gave them skin rashes. “I realized that there were problems in the pet industry and that bad information was going out, so I wanted to help fix that,” Bloch said. Fast forward to November 2017 when Bloch, a Management senior in the new Entrepreneurship and Innovation track at St. Mary’s University, launched her online pet supply store, Cloud 9 Lives. Now, the young entrepreneur is a step — and a paw print — closer to making her dreams come true. “My goal is to reshape the pet industry through education and innovative design,” said Bloch, whose startup was selected by the innovation nonprofit Velocity TX to join its tech incubator. For now, Cloud 9 Lives is a one-woman shop, with Bloch working like a dog to manufacture her merchandise, manage content on the website, and process and deliver orders. Bloch is also the lone wolf of her marketing team. She’s handed out business cards and has been invited to the Pearl Weekend Market to spread brand awareness. 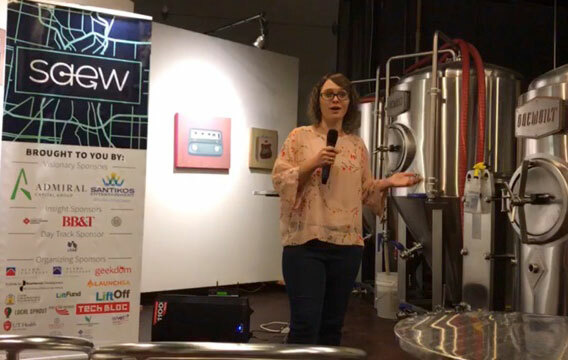 She’s also participated in business pitch competitions, including the San Antonio Entrepreneurship Week Pitch Tab Competition, during which she delivered a 90-second elevator pitch about Cloud 9 Lives to a panel of judges. Bloch placed first out of 10 participants in the competition, earning $150. Like a dedicated entrepreneur, she invested the prize money into her business. “I look back and see how my time as a business school student at St. Mary’s has shaped everything I’m doing,” Bloch said. Bloch pitches her online business at the San Antonio Entrepreneurship Week Pitch Tab Competition on Nov. 16, where she took first place. These are sweet words from someone who started her first business — a cupcake delivery shop — when she was a junior at Business Careers High School in San Antonio. She ran the food business, called Kate’s Cakes, entirely from her parents’ kitchen. Bloch managed all operations for one year before the business closed. So how did St. Mary’s fit into her entrepreneurial vision? Bloch has excelled at St. Mary’s, discovering a home away from home. Sergio Palacios, Ph.D., Visiting Assistant Professor of Entrepreneurial Studies, taught Bloch in a course called The Entrepreneurial Mindset and has used her experiences to help teach important business lessons. Bloch credits her Management courses for helping her to think like an entrepreneur, and her St. Mary’s Core classes for widening her business scope — and her personal mission.